The Virtual Weber Bullet will be celebrating 20 years online this coming June! To commemorate the occasion, I'd like to send you a 20th Anniversary t-shirt when you use this link to make a minimum $20 donation to TVWB! 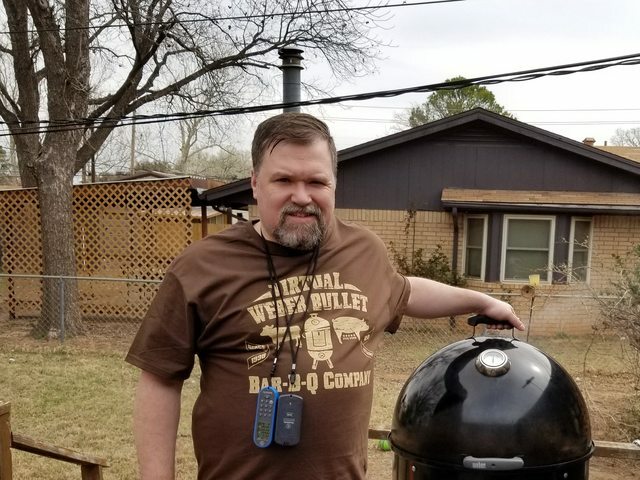 Design features "Virtual Weber Bullet Bar-B-Q Company", "Since 1998", "20 Years", WSM, cow, and pig. Screen printed using vintage ink for weathered look but long durability. Available in chocolate brown (M, 2X) and black (4X, 5X). ONLY 1 4X T-SHIRT LEFT! NO MORE L, XL or 3X. Hanes Beefy-T tagless 100% preshunk cotton, short sleeve, design on front. Limited to 144 t-shirts total. If you live outside the US, contact me with your full mailing address and I'll get back to you with an adjusted donation that takes into account international shipping costs. Don't forget to indicate t-shirt size and mailing address when ordering. Received my shirt today. Thank you Chris! And thank you for this site and everything you do. It is much appreciated. It was also nice meeting you at Harry Soo’s class in Oakland a few years ago. Love the photo, Dustin. Thank you! There we go! Texas representing! California is in the house! Notice the piggy Christmas ornament from Target. All of my WSMs and piggy Christmas ornament are loving stored in the garage when not in use. They should come outdoors soon. Too much rain. Last edited by Donna Fong; 03-21-2018 at 10:43 AM. Greetings from Delaware, Chris Well Deserved Donation on its way! Donation on the way Chris! Thank you!!!!!!! Duh! I think i forgot the size. Large if you have one. Last edited by Rolf Jacobsen; 03-28-2018 at 03:11 AM. Big batch of t-shirts going out...still plenty available in all sizes M-5X. My gift to you with a minimum $25 donation to TVWB. I'm in - I didn't select a size - XL please!